We expertly guide you to find “the dress” and offer a fresh perspective on what to wear for engagement celebrations; pre/post wedding parties; and honeymoon. We start each collaboration with our brides by creating a White Dossier. Beautiful mood boards are produced just for you, designed to inspire and direct your journey through bridal style. Shared with you over email, it will contain all the inspiration and information you’ll need to purchase your dress. We get to know you via a complimentary phone call where we discuss everything from what décor you’re having at your wedding to what you feel suits your body type best. Once we understand your needs and know what budget we are working to, we consult our prized network of people and places. Your White Dossier will be made up of beautiful mood boards, designed to inspire you. As well as containing detailed information on the designers and silhouettes that fit to your taste and budget, it will also detail which boutiques you should visit to try them on at. From guiding you through your bridal appointments to sourcing dresses for your bridesmaids, no task is too big or small for our Bridal Concierge. We take what can be an overwhelming experience and turn it into one that exceeds your expectations. As a Bridal Concierge, it is our role to ensure our brides look and feel the very best versions of themselves on their wedding day. Jess Hawkins is the epitome of a t-shirt and jeans kind of girl. Ex denim buyer at Topshop and now founder and creative director of I & ME, Jess shares how she stayed true to her style with designer Alessandra Rich and why “buy less, buy better,” applies to your bridal wardrobe, just as much as it does to your jeans! Just one week after getting engaged, New York based Samantha Klein had her dream venue booked. Finding her dress was not as easy! 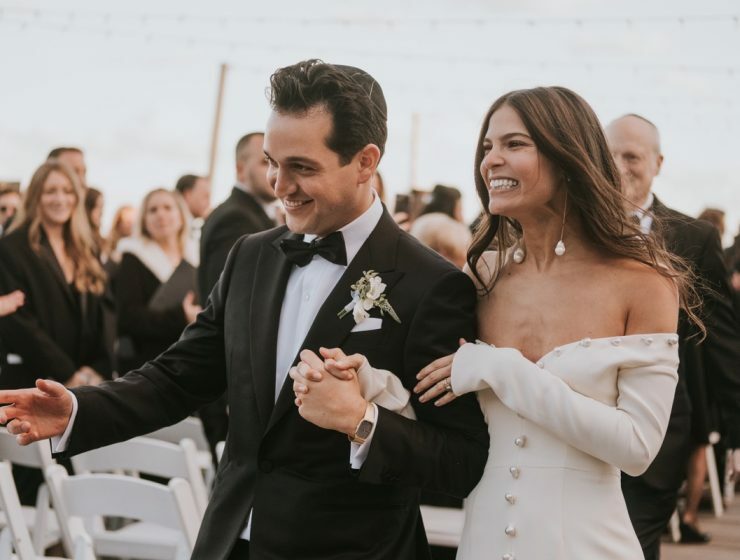 With just three months to go, she was still searching for “the one.” Here, she shares how White Dossier gave her style inspiration and how holding out for what she originally envisioned herself in paid off. Our Bridal Concierge service is all about you. We’re here to ensure the milestone of becoming a bride is given the care and attention it deserves. Whether you have a strong idea of how you want to look and feel, or have no idea where to start, we ensure that when it comes to each of your wedding moments, you glide through them with style and ease, feeling the very best version of yourself. Let us elevate your bridal experience and enhance your bridal style. White Dossier offers a highly personalised service and our pricing is therefore tailored to the needs of each of our brides-to-be. All costs are assessed during a complimentary, introductory phone call and are then shared and agreed on before we start working together. Our team has experience working across all budgets. If you have any requests, don’t hesitate to ask – no task is too big, or small. Each White Dossier is priced depending on your needs. As well as the bride, this service is available for mother of the bride, maid-of-honor, bridesmaids and the groom. From booking your bridal appointments to sourcing honeymoon perfect swimwear, the format in which we offer our Bridal Concierge is flexible to your individual needs. We’re here to elevate your bridal experience and enhance your bridal style. London offers an unrivalled experience when it comes to shopping for your bridal wardrobe. Our concierge will organise every last detail to ensure you find your dress and have time to enjoy the city too! Book an in-person consultation with our Concierge at London’s first ever bridal department store in Marylebone. Ready to have your White Dossier created?